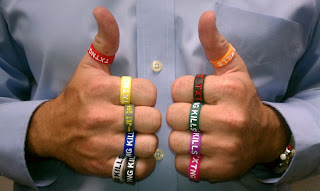 TEXTING KILLS thumb bands are only $1.50 each OR LESS! 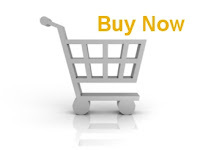 See bulk pricing page for large orders. TEXTING KILLS thumb bands come in a variety of colors for all your fashion needs. All have TXTNG KILLS debossed in white. Check out the new styles! JST DRV and DNT TXT N DRV thumb bands are now available! Get one for each day OR one for each finger. 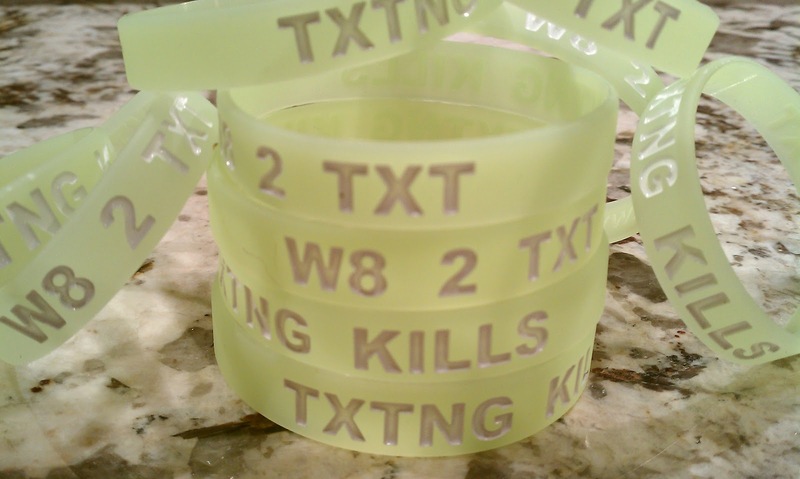 Give them away to your friends so everyone has a daily reminder that texting while driving is dumb and dangerous! 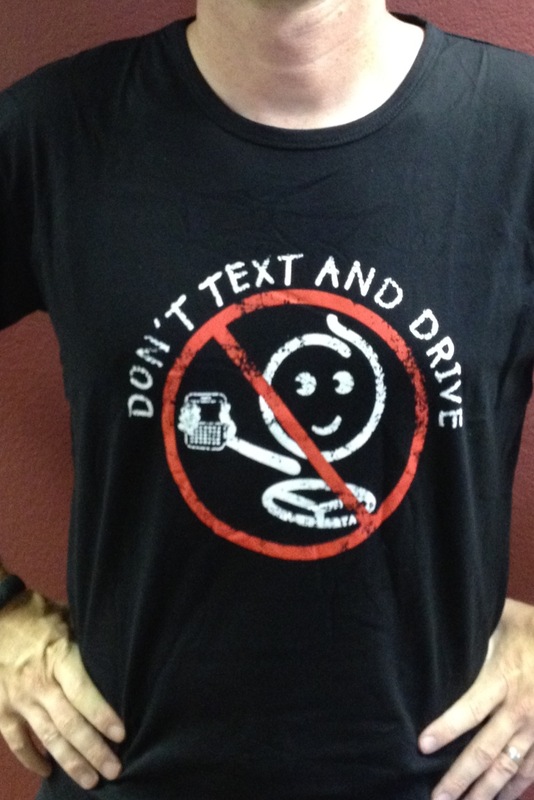 Now you can also get your DNT TXT N DRV bumper/window stickers so everyone else on the road around you can see the message. 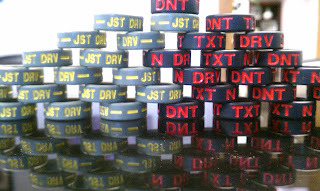 DNT TXT N DRV Stickers are only $1.50 each OR LESS. UV coated to be durable and long lasting. 3.5" x 7.5", glossy and sure to get the message across to the drivers around you! Get your text free pledge with every order! 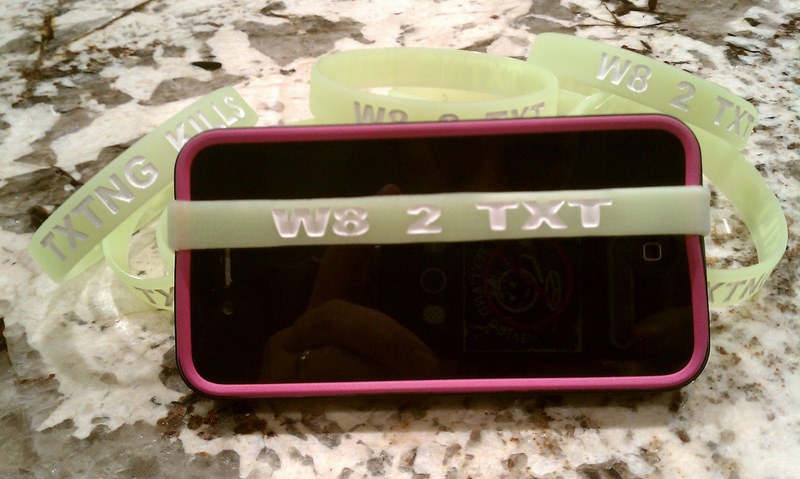 Glow in the dark wristbands and re/black swirl wrist bands have two messages: W8 2 TXT on one side and TXTNG KILLS on the other. They also fit great around cell phones as a reminder not to text and drive every time you get into your car! Wristbands are also only $1.50 each or less (depending on how many you buy). W8 2 TXT Thumb Bands are available in a variety of colors and have a very direct, simple message - wait to text! It's a great reminder to all drivers that texting can wait if you're driving. Available in BLUE, RED, WHITE, BLACK and PINK.